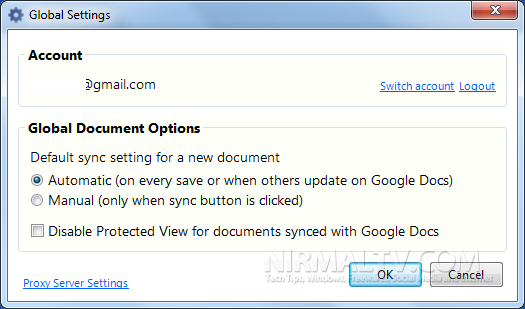 Google has released a new add-in for Microsoft Office, Google Cloud Connect, which allows users to save and share documents directly from Office 2010 to Google Docs without any manual upload. Apart from saving you can also do collaborative editing which means multiple persons can edit the document at the same time and also the work is saved with revision history available. You can use the Google Cloud Connect add-in for Office with Word, PowerPoint and Excel. To start syncing the documents, first download and install the plugin from here. Once installed, you can see a new toolbar available when you open Word, PowerPoint or Excel sheet. The first step is to login to your Google account by clicking the login button. You need to authorize the add-in to access your Google Docs account. Once the authorization is done, you can see your account added to options. You can also switch account and log out of your account any time. There are two options to save the document to Google Docs. If you select the automatic way, when you save the document using the save option, the changes are reflected on your Google Docs as well. In case you choose manual, you need to click on the Sync button to make all the changes available to cloud. When you save any document to cloud, you can see the document link available for users to share it. You can also view the revision history in case multiple users are editing the document. You can selectively open the revision history and make changes to the document. 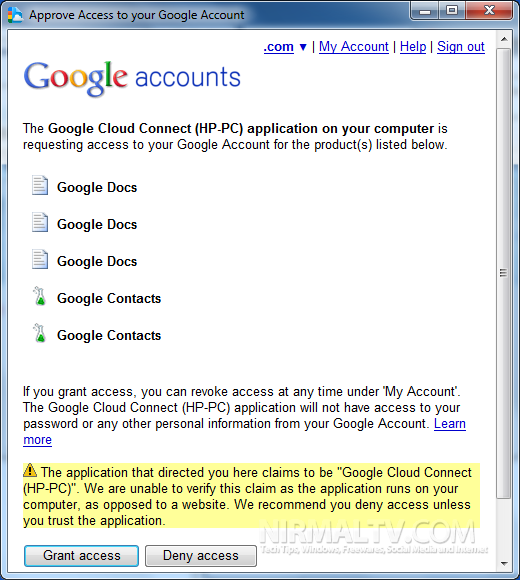 Google Cloud Connect is supported on Windows XP with .NET Framework 2.0, Windows Vista, or Windows 7 and Microsoft Office 2003, Office 2007, or Office 2010.